After China dashed hopes that a raft of macroeconomic data released last night would help reassert stability in markets, the Communist Party has, at the very least, finally confirmed post-G-20-summit headlines proclaiming that China's Ministry of Finance would roll back the retaliatory tariffs on US-made autos imposed over the summer. The rollback was first teased by President Trump after he returned from Argentina last week, before Treasury Secretary Steven Mnuchin hedged the president's claim by saying rolling back auto tariffs had merely been "discussed." But as many analysts have pointed out, most of the cars sold in China are made there already, which means that rolling back the tariff is a largely symbolic gesture. Also, the move is only temporary: tariffs will be suspended for three months, which means they could be reimposed if the US and China fail to strike a lasting trade pact. Tariffs will fall from 40% to 15%, back to their pre-trade levels. The cuts will take effect on Jan. 1. Still, shares of carmakers - particularly European carmakers, which build more of their cars of the Chinese market in the US - rallied on the news. Meanwhile, US stock futures pared their China-inspired losses from earlier in the day. 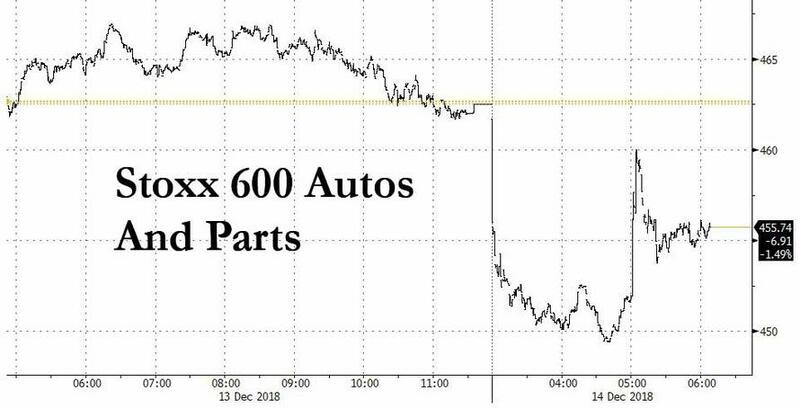 In Europe, the Stoxx 600 Automobiles & Parts index was trading 1.4% lower after the announcement, paring earlier losses of as much as 2.8% that, ironically, were triggered after new car registrations fell for the third straight month. In a statement accompanying the announcement, the Chinese Finance Minister said it hopes "China and the US can speed up talks to remove tariffs on all additional US goods."